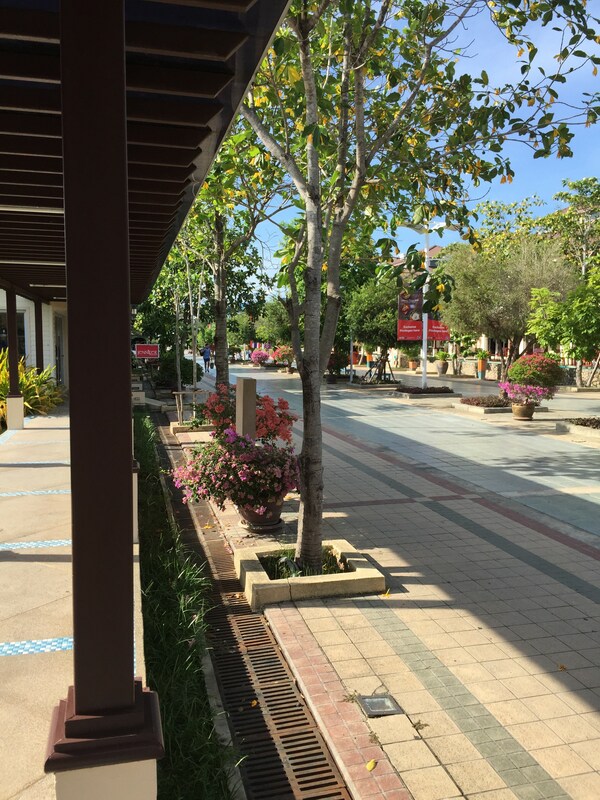 Today, the weather in Koh Samui is “95, feels like 116”. Considering that, I don’t feel half so bad about feeling warm and unpleasant — or about feeling that the air is that way. Or both. Thankfully, it’s predicted to drop to 90° tomorrow, with a 60% chance of rain, and 88° the days after. So, yaay that. As of my last post, I’d said I was staying at this beach house in Koh Samui for another month, because it was a bit late to schedule something more elaborate after my Nepal trip fell through. Latest news puts the death count there at over 7,500, including about 60 foreigners but with over 1,000 foreigners still missing from Europe alone. (Doesn’t mean they’ve perished, but they haven’t reported in.) The place I was going to stay in Kathmandu was unharmed — it’s really the older and poorer places, as usual, that suffered from the quake. My Airbnb host and her adult kids are fine (and recommended that I cancel the trip), and my Pokhara lodgings and host were similarly unharmed. Airbnb officially refunded the processing fees they normally charge for cancellations, for anyone cancelling Nepal trips. I had to eat the airfare, but whatever. In theory, I could have gone anyway and tried to help out when I arrived, but I didn’t seriously consider that option. I’ve read too many disaster relief stories over the years (Haiti, for example) to be under any illusion that this would be helpful, and this article confirmed that for me. If I’d been there already when it happened (and survived), I’d have been one of those “help sift through rubble” folks, but they don’t need a middle-aged computer tech making a special trip to perform unskilled labor. (“Help, this building has collapsed! Can anyone write a hash sort routine that will function efficiently on data distributed across a network?”) If there’s one thing Nepal has in abundance, it’s labor. Instead, I’ve sent money via Oxfam and via the Tibet Fund (other methods here), which will be far more useful. Of course, I still had to leave the country and go someplace, because while my visa is good for a year, it requires that I leave and reenter every 90 days and my first 90 days were coming to an end. (Which is weird; it seems like twice that long. Of course, that’s the secret to extending your lifespan; don’t try to live longer, just have more experiences.) So, since I was flying to the major international hub of Kuala Lumpur for the first leg of my Nepal trip, I figured I’d just stay there overnight or for a few days, and then fly back and stay on Samui for another month. The owner gave me a decent deal on the rent, $800 for another month, and that sounded like a reasonable option, back when the weather was a bit cooler and rainier. I considered staying and touring Kuala Lumpur a bit, but then checked the weather and saw that the humidity was 100%. So, that was a big old Hell No, and I booked a flight to come back the next morning. Quick side story: a few days before the quake, I’d finished playing ESO for the day, opened my Mac laptop to do computery things, and the screen stayed black. The power light was on, and I did the usual “hold the power button down to force shutdown” thing and powered it back up again, a couple of times, but no joy. Sigh. I guessed that something about the screen or graphics processor was broken, and used my gaming laptop to start hunting in Kathmandu for authorized Apple repair centers… and I did find one, so that was great. I even read up on an Apple display problem that affected laptops of that generation, that should get me a free repair! But as the hot day continued, I noticed how hot my gaming laptop was running, shut it down to avoid possible damage, and wondered: my Mac laptop sits very close to my gaming laptop when I play, propped up against the wall behind it, and it get pretty warm from the gaming laptop’s radiated heat. And it was a hot day: could the Mac have just been too hot to run, especially at the start, if it was already hot before the fans could kick in? By early evening, with cooler air and all the electronics off for the afternoon, I opened the Mac again and it started right up, no problem. Since then, I’ve been extra careful about using these things when they’re physically hot to the touch, I don’t start the Mac except from room temperature, and I have it resting on small supports (clothes pins) so that it gets airflow underneath. My trip to Kuala Lumpur was really quite straightforward. In fact, it was even easier than originally planned because I left almost all of my stuff at “home” and just carried my little day pack with toiletries, my travel docs, and my iPad. I’d carefully planned my groceries to run out just as I was leaving for Nepal, which was a bit of wasted planning, but no worries. I’d made arrangements with Ian for a lift to the airport: you may remember him as the owner’s property manager who’d picked me up from the ferry area, after my arrival lunch at Max Murphy’s Irish pub; the British fellow with the Range Rover who had readily expressed certain opinions about the native chappies. He collected me at about 3:45, and we had a great drive around the north shore of the island to the airport on the northeast corner. The conversation was quite entertaining, and with much less British colonialism in evidence. 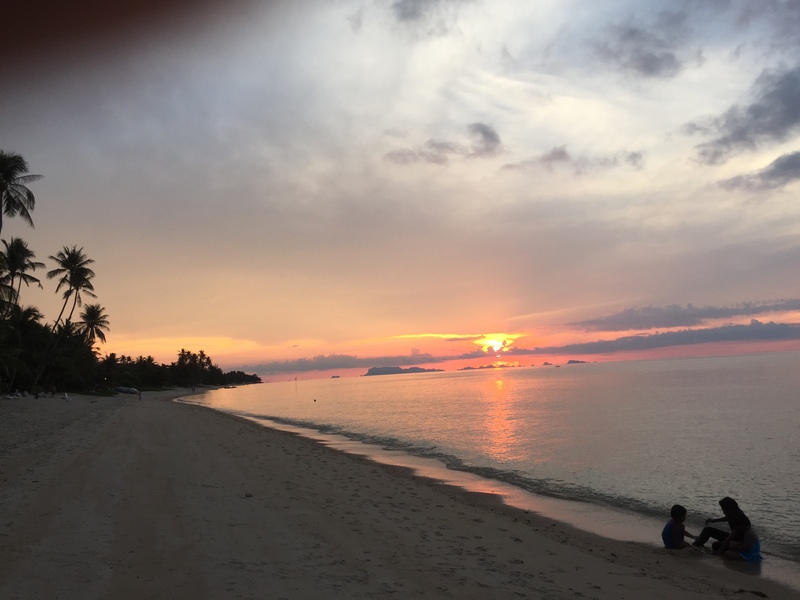 Ian and his wife had first visited Samui 12 years ago, and had been living here for 10, and apparently there’s been a huge change in the island, in even that short amount of time. He said that the second time they came, they stayed in the same hotel, which they’d liked (relaxing and peaceful, among other virtues), and when they arrived and told the taxi driver where to take them, he got very excited and told them how lucky they were. Yes, they said, it’s a very nice hotel. No, no, he said, it’s because the island’s first McDonalds is opening right across the street, at midnight that very night! This was, as you can imagine, somewhat less exciting for Ian and wife, and it was the canary in the coal mine for many things. He said that there didn’t used to be many overweight people on the island, but it’s been increasing steadily since then. I’d noticed that southern Thai were chunkier and darker than northern Thai; I’d rarely seen a Thai person in Chiang Mai who wasn’t fairly lean, but they were noticeably heavier down here. Some of the weight difference is purely ethnic; down here, they’ve more in common with Malaysians and Polynesians, who are heavier. But Ian said that with the increase in fast food and packaged foods, even in just over 10 years the change on the island was noticeable. Modern crap diet takes its toll. One other particularly useful thing came out of this airport run: Ian was willing to let me ship something to his place from Amazon. You wouldn’t think that this would be a needed thing, but where I’m staying now has no address. None. The owner, Steven, said I should have something shipped to a DHL outlet nearby on the island; he’d also said that for most places with addresses, the address is a number — a sequential number indicating the order in which new places were built! 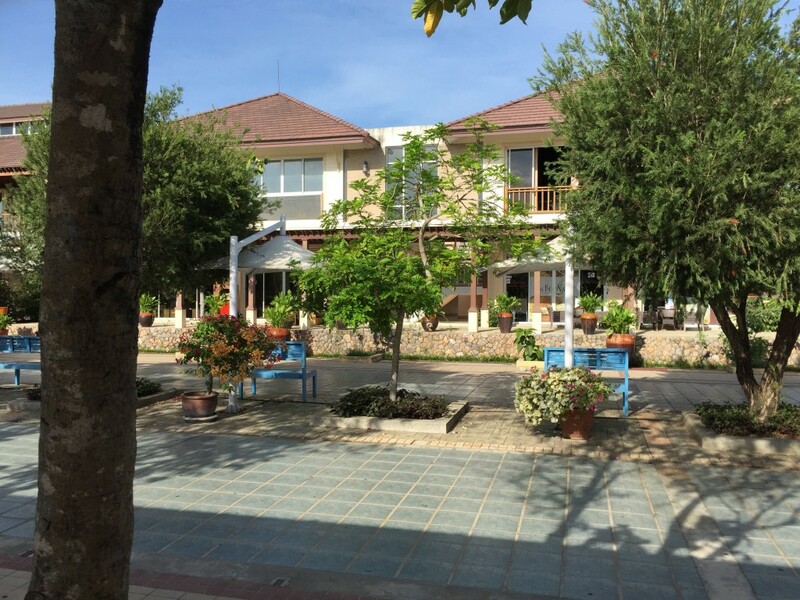 Think about that, for a second… You might live at Number 1287 on Koh Samui, which could be anywhere on the island and does nothing to tell you how to go there or deliver a package. It just happens to be the 1287th place built and assigned an address. I don’t know how seriously to take that, because I can see number on the buildings on the main road, that seem to follow the usual sequential pattern, and Ian has an address, so clearly some places do. But Steven doesn’t. Anyway, I asked Ian if I could send something to him and he said sure, no problem. You may already be asking what, so I won’t keep you in what little suspense would be merited; I need a charger for a small chargeable grooming device that I brought at the last minute. The thing is, as I was planning what I’d take, I discovered to my delight that all of the devices that I planned to take worked with both 110 and 220 volts, so I didn’t need a transformer. And Thailand uses sockets that are configured to take either US or European plugs, so I was not going to need any plug adapters either. At the last minute, I tossed in a small, lightweight grooming device and charger, that was really good as a clipper and nose hair trimmer — it’s crazy useful for those very specific tasks, and while I could make do without it, and had planned to, at the last minute I decided to include it. Unfortunately, adding it at the last minute, I neglected to double check that this also worked with either voltage, and the first time I needed to recharge it in Thailand, it not only didn’t recharge, I learned later that I’d fried the charger. I figured that I was screwed, and that the device would be deadweight for 8 months until I could get back to the US and replace the charger, but on Amazon I did find a dual-voltage charger that would work with it. The problem, of course, was that I wasn’t staying anyplace long enough to that I would have a useful, overseas, delivery address, given that Amazon Prime 2-Day Mail wasn’t going to be possible. Thankfully, the extra month in Koh Samui made it possible, and the thing should arrive between May 14-22 (knock on wood), and Ian was willing to be the recipient. So I may soon look forward to properly trimmed nasal passages, as The Lord intended. Hallelujah! So, back to the travel. Ian dropped me off at the arrival terminal, and let me know where he would pick me up when I returned the next day. 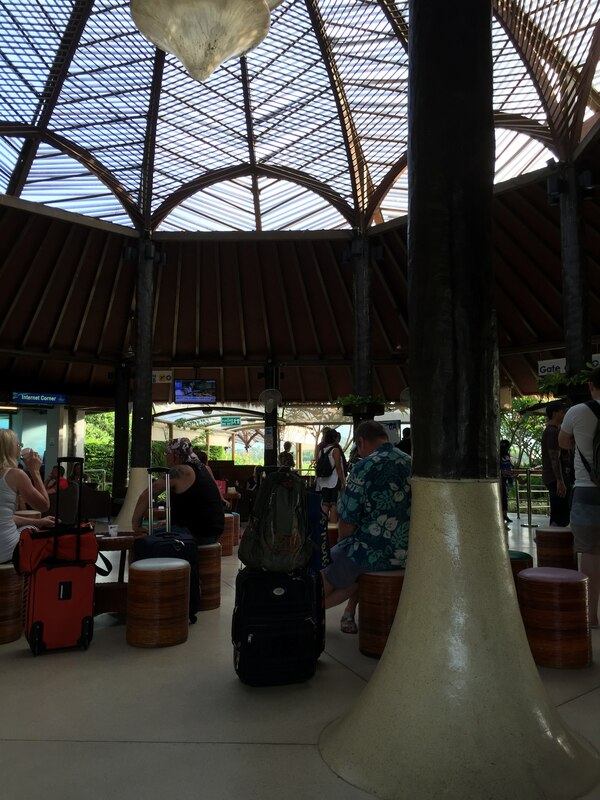 The Koh Samui airport is, in truth, a little bit weird. First, it’s all open air, with fans; no AC. Second, the airport has this open air arrival area, with ticket desks for all the airlines (mine was Malaysian Airlines, operated by Bangkok Airways), and it’s a self-contained area; you drive in (or park long term, I think), drop people off, and then leave without being able to ever drive past any other part of the airport. Drive in, drive out, and that’s it. As the traveler, you get your ticket, then walk north along a sidewalk, leaving the ticket desks and the car area, and enter a one block shopping/dining zone with no car access, that reminded me immediately of a small Santa Monica Promenade (or Downtown Disney), with shops on each side of a wide avenue with a central island strip. 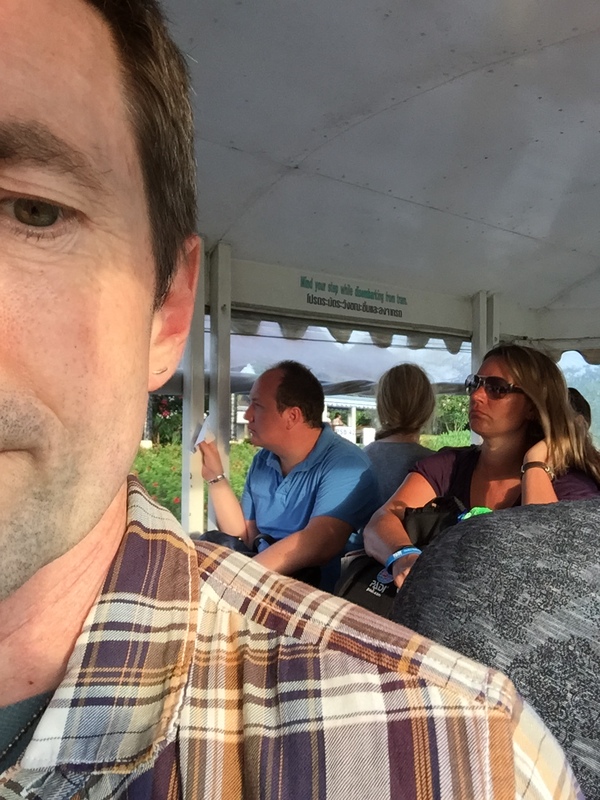 This seems ideally designed for small shuttles/golf carts, carrying less able travelers, but there were none. Note: Objects in the photo are warmer than they appear. This area is particularly notable in that it had… drumroll… another Max Murphy’s Irish pub! Yaaaaaay! I wasn’t particularly hungry, but I had plenty of time before my 5:55pm flight, and there’s was absolutely no way that I was saying no to a Guinness. Once Guinness has been achieved, you keep walking, and reach the arrival/departure zone, where the actual boarding and deplaning happen, another open air area with isolated traffic access for people picking up arriving travelers, with fans, and a simple security area and metal detectors. This leads you to a circular, high ceiling, waiting area, comfortable enough if you didn’t exert yourself with much heat-inducing movement, with food and a couple of (duty free?) shops. Think the Enchanted Tiki Room, but without the animatronic birds. Or the music. Or the AC. There was some excitement while we waited for our plane: a shriek came out of the duty free shop, and a number of functionaries came over and started milling about, and they turned off the lights in the shop. I don’t really know what happened, but I’m fairly confident in my guess that some kind of bird flew into the shop and they were hoping to get it out. After 20 minutes or so, they announced the start of boarding. I wasn’t in the first group, so I headed to the men’s restroom first, where I discovered a wall-to-wall aquarium over the bank of urinals. There is no picture, sadly, because I really couldn’t see standing behind the other patrons, snapping photos of them while they did their business, but it was a pleasant and quite aesthetic surprise. Boarding, when it was my turn, was a matter of getting on a tram and being driven out on the tarmac where our plane rested, which added further to the odd Disney vibe of the place. Ladies and Gentlemen, the Minnie Mouse tram will arrive in: 2 minutes. The flight was a mere 95 minutes long, and they served a full meal. I mean, a real meal, with surprisingly good food, metal utensils (knives included), and everything! It was kind of astounding. We’ve been getting used to airline cost cutting measures in the US for decades now, and you’re lucky to get a bag of nuts on a short flight and not much more on a long one. This was like getting a free business class meal on a flight from LA to San Francisco. I. Like. It. 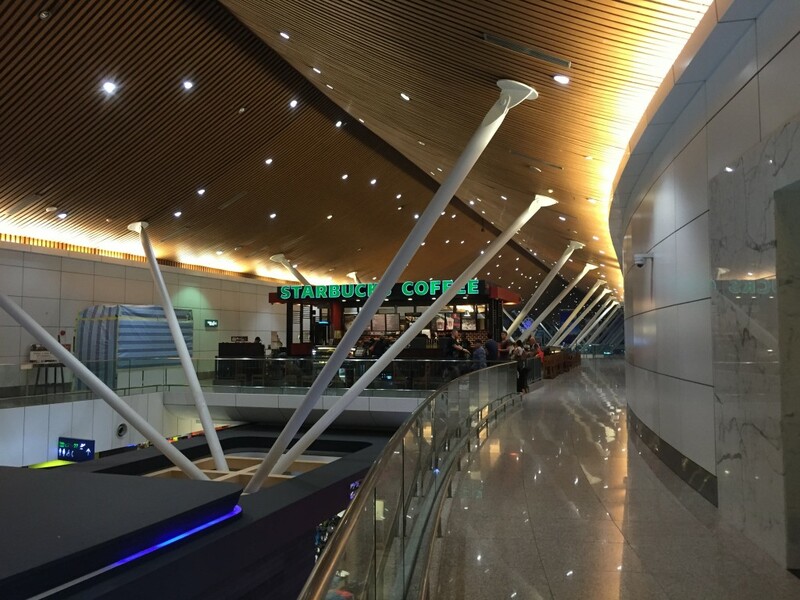 Arriving at Kuala Lumpur was supposed to be tricky. Here’s the thing, and I’ll try to make this simple: I’d been flying into KL, and flying out to Nepal, and I’d decided to stay in an airport hotel (Sama Sama Express) that, in theory, meant I could stay in the International Terminal and never have to go through customs. Cool, right? Except: it turned out that Kuala Lumpur has not one but two International Terminals, and they’re not directly connected, and my flights were in different ones, and I was going to have to exit through Customs and go back in to the other terminal through Security to make the change. Grrrrrr….. So, since the hotel had two locations, one in each terminal, I picked the one in what was my outgoing terminal and figured I’d make the switch when I arrived instead of the next morning. Then, the Nepal trip got screwed, and my flight back to Koh Samui the next morning was departing from the original terminal. Aaaaagh! So now, I was faced with leaving through customs, going back through security to get to the other terminal where my hotel was, for which I’d need to pick up my Nepal ticket (it had been too late to cancel the flight), and then reverse the process the next morning to get back to the original terminal. I realized this on Monday, and looked to see if I could book the other hotel branch, but the rooms were now in the $200-$300 range, for 12 hours, instead of the $90 I’d already coughed up for the other place. (Commuter hotels seem to charge for partial days. Like Love Hotels, I guess.) Drat. Then I went out to get a boarding pass for my 8:30am flight. This proved problematic. After standing in line, the ticket guy directed me to the gate and said to go there — which I presumed meant that I’d get the boarding pass at the gate (plausible). But when I got there, there was a large line to go through the security scanner for that specific gate, and it seemed hardly possible that they’d let me through without a ticket. So I went back, got a different person, and after a lot of consultation with colleagues she told me the same thing and directed me back to the gate again. Ooookay. So, I went back to the gate, went through the scanner without being questioned, and found a desk on the other side where, sure enough, they printed me off a boarding pass. Which, 2 feet away from there, a guy took to let me into a waiting area, and thence into the airplane 20 minutes later. We departed nearly on time — and once more received a really quite good, full meal, leaving me feeling like a hobbit after second breakfast but properly appreciative. I arrived in Koh Samui, went through customs easily and got a new 90 day stamp, and that was that. (Except for the brief conversation with the American guy in his mid-30s who’d been about to start a photography business in the area until he got hired by Apple and moved to SF. I offered him my sympathies and he acknowledged them gratefully.) I arrived at 9:30, Ian was to pick me up at 10:30 out on the main road past the airport exit, so I stopped at Max Murphy’s again and had another Guinness. (I highly recommend bookending every trip in this manner.) I had more good conversation with Ian on the way back, and that really was that. Since then, it’s all been pretty routine. ESO in the morning, reading Twitter and literature (I’ll mention a book next time, but I’m really at my word limit here), watching TV and movies, and sweating. Lots of sweating. Also, I’m way overdue for a haircut, but hope to remedy that tomorrow at a place I’m told is down the street across from the 7/11. (We’ll see if that’s true; if my groomer were working, I’d be sorely tempted to do it myself. It’s probably better that it’s not.) I’m here until May 27th, and this week I’m going to figure out where to next. Here’s a hint: it’s going to be someplace cool. That’s still not Chiang Mai, where it continues to be unseasonably hot and dry with dubious air. Avoiding this, and being cool, was half the point of Nepal, and outside of Nepal, the Asian choices for Cool + Cheap + Decent Internet + Not Communist are remarkably few. Leading choices other than Nepal were Bhutan (where it turns out that the government strictly controls visitation, and requires that you spend at least $250/day while you’re there), or Northeastern India (which remains a possibility, despite the suspect conditions common in India). However, as I research this, where I’m leaning towards now is either Australia/New Zealand, where it’s late fall and the temperatures look awesome, and Hokaido, Japan, so far north in those islands that the temps are still quite springlike and pleasant. Neither of them are super cheap, but they’re both interesting, and as long as I’m in this part of the world, seems like a shame to waste it. I’ll let you know. Monday, Nov 16th – From someplace in Asia (TBD), fly to Hong Kong and stay overnight. Tuesday, Nov 17th – Fly from Hong Kong to LAX, visit Mark and Jane in LA, and stay through Thanksgiving. Tuesday, Dec 1st – Sarah flies down to LA. We rent a car, and on Wednesday the 2nd Sarah and Mum and I drive up to SF to visit Aunt Florida. Sunday, Dec 6th – We leave SF, and drive up to Seattle. Thursday, Dec 10th – I fly to Bozeman to visit Lynne and Roger, while Mum flies home (presumably). Thursday, Jan 28th – I fly to Europe. I’ll send everyone more details individually, including other friends I may be able to visit while staying in these parts of the country. Writing off into the sunset. This entry was posted in Uncategorized and tagged Amazon, Bangkok Airways, earthquake, Guinness, Koh Samui, Kuala Lumpur, Malaysia Airlines, Max Murphy's, Nepal, Sama Sama Express, Starbucks. Bookmark the permalink. Starbucks!?! Whoot whoot! A Venti 2-pump toffee nut latte with whip, please. It’s a shame you are not staying longer in Hong Kong – what a fascinating place! And they have a night market that looked like something out of Blade Runner, with creepy, crawly things for sale that looked like they originated from outer space! Is Bali or Singapore too warm this time of year to visit? What happened to your idea of visiting Croatia? A lot of choices, though I agree that while you are over there, Australia/New Zealand (or Japan) would be amazing. Croatia is for next year, during my European tour. This year, Asia only. And southeast Asian mostly, due to the regional health insurance plan I picked up. Having just been there, those shots are SO Disney-esque. Also omg your captcha is SO CUTE! Thanks! That unusual captcha was the first thing I did that actually made a dent in the bogus new users and the comment spam, and it stopped them cold. Cute and useful, my favorite combination. How about visiting the Philippines in June ? It is summer now, from March through early June. By mid June, the weather will get more comfortable even without turning on the air-condition (I think, it has been so long). The only concern I have is the air quality, it is horrendously bad and polluted but I only lived in Manila before, the air is supposed to be in the province. Have you considered Burma, though I have concern on its internet service. Taiwan, it is an awesome place. The living expenses is very reasonable especially outside of Taipei, and even in Taipei, it is still affordable. The public transportation is great, it is extremely convenience in Taipei, subway and buses basically cover everywhere you want to go. It may not be as convenience if you are in the southern part of the island. In Chiayi, where we stayed these past 2 years, bus service is almost non existence because everyone ride motorbike. You ride motorbike. The internet is really-really good even in the small city. Food should not be a problem for you, you will enjoy the island very much ! Oh, well, I forgot to mention, the weather at this time is between 70-85 plus humidity depending on if there is a typhoon or not. The mosquito may be another feature. But we love the place so we are going back to the village in early July so we can enjoy the 95 degree ‘cool’ weather. As Andreas’ wife said, it is all in your mind, it is not that ‘hot’. How can it be worse than your old office in FAB 🙂 . 80 degree at 8 in the morning ? Yeah, but Andreas’s wife is crazy, so there’s that. “All in your mind” is all well and good, but “95 feels like 116” has a physical reality to it that demands attention. Of course, that’s here on Samui, not Taiwan, but the point’s the same. However. After realizing that Taiwan was on my list of covered countries for insurance, I looked it up on Wikitravel, and they make a pretty good case for the area near Taipei being fairly pleasant, temperature wise. And your “good internet” point adds further appeal. And it’s conveniently located. I think I’m adding it to my destination list. I’ll send you an e-mail about when your trip this summer is. You won’t have time to hang out, but if the timing works out we can probably grab a meal or something, on your way in or out. Woo-hoo!